Harshest and bleakest of Shakespeare's tragedies, full of violence and hopelessness. Old and ready to resign his throne, Lear plans his last act as king of ancient Britain: to divide the kingdom between his three daughters, giving the most to the one who professes to love him best. His self-serving daughters Goneril and Regan are more than willing to flatter him with professions of undying love, but his youngest, Cordelia, is far too sincere in her filial respect to follow their lead. Enraged by her response, Lear banishes her - and so begins his descent from selfishness into madness and despair as the kingdom is torn by war. Most of the characters, both in the main plot and the subplot, demonstrate the vices of greed, pride, selfishness, and excessive ambition in their darkest colors. The concept of honoring one's parents (or not honoring them) also plays a major thematic role in the parallel stories. Regan and Goneril flatter their father until they gain the ends they wish for, and afterward show him no filial respect, even going so far as to turn him out into the wilderness. In the subplot, an illegitimate son who chafes under the stigma placed upon him by his birth defames his half-brother, deceives his father and eventually betrays him. None of these heinous crimes are at all condoned; Shakespeare presents them in all their tragic darkness. On the other hand, Cordelia represents filial love and selflessness; she even goes so far as to wage war against her two older sisters and their husbands in order to regain the kingdom for Lear. In the subplot, Edgar, legitimate son of the Duke of Gloucester, honors his father as well. 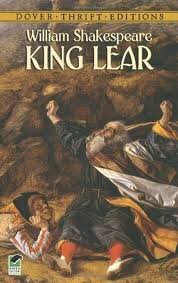 In terms of honor, Kent also stands out in his loyalty to King Lear (despite Lear's harsh treatment of him). Characters swear by the Roman gods and by gods in general. When a character dies, his "ghost" (spirit or soul) is mentioned. "King Lear" is perhaps Shakespeare's darkest play and the violence is both common and brutal. Edgar is wrongly accused of plotting to murder his father. A man's eyes are gouged out; a servant, defending him, mortally wounds his attacker but is slain himself. A character is put in the stocks. In a swordfight, a man is fatally wounded. One character poisons another, then commits suicide. A woman is murdered. A man dies of shock, another of a broken heart, and in the end one character seems intent on suicide (his fate is unclear). Edgar, disguised as a madman, says he "loved wine deeply." Early on the Duke of Gloucester blithely discusses Edmund's illegitimacy. Edmund also muses on the circumstances of his birth, believing it has destined him to be villainous. Edgar (in disguise) goes on a monologue about his past sins, including fornication, and ends by encouraging young men to stay away from brothels. Both Goneril and Regan lust for Edgar, despite the fact that they already have husbands. Cordelia, on the other hand, seems to have a good relationship with her husband. As this is a thorough tragedy, there is little bawdy "humor." "B******" is used numerous times in reference to Edmund, the Duke of Gloucester's illegitimate son, and by Edmund himself. "W****" and derivatives are used. See Sexual Content. The back of the Dover Thrift edition calls this play "one of the most relentlessly bleak of Shakespeare’s tragedies," and the assessment is accurate - not even a Hamlet or an Othello touches this play for tragic depths. There is nothing absurd (as in Romeo and Juliet) or superb (as in Macbeth) about the ending and the demise of its titular character; in contrast to the exaggerated themes of his other tragedies, those in "King Lear" — madness, greed, selfishness, cruelty, ingratitude, suffering, and sheer meaninglessness — are so realistic as to be painful. In the rantings of Lear, the babblings of "mad" Edgar, and the cacklings of the Fool, a desperately fatalistic philosophy of life is presented. Indeed, the ending is so hopelessly dark that later performers tended to change it into a happier one. Such a twist would, however, rob the play of the very darkness and hopelessness that makes it stand out from the crowd. It cannot really be read (or performed) for "entertainment;" it is too downright depressing. On the other hand, it does present a picture of life as it seems to many eyes - like the first half of Ecclesiastes, divorced from the second. As such, I would certainly not encourage anyone to pick it up as a light read for a rainy day.